New Jersey Gov. 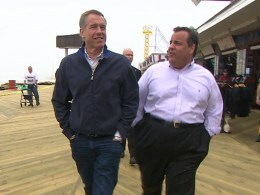 Chris Christie tours the Jersey Shore with Brian Williams talking Sandy recovery, his weight loss surgery, and the 2016 presidential race. >>> for many months to interview new jersey governor chris christie on tuesday morning this past week. the morning came and there was a story on the front page of the "new york post." it said the governor a few months back had checked himself into a new york hospital under an assumed name at 7:00 a.m . on a saturday morning. by 8:00 a.m . he'd had successful lap band surgery to control his weight. he's already lost an estimated 40 plus pounds, but had we known in advance about the surgery we might not have set up the interview right next to where they sell the sausage and peppers and the fried oreos along the boardwalk in seaside heights, new jersey , where we both visited as kids and where we still go with our own families during summers at the now battered jersey shore . he started out by talking about his surgery, his decision and his health. >> i finally came to the conclusion when i turned 50 that i needed to do something. i did not want to take the risk of becoming unhealthy and the ramifications that would have more mary pat and for my four kids. as you know, i still have children who are in middle and elementary school . i have a long road as a father, and i don't want to miss any of it. 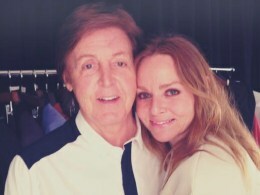 >> his now famous letterman appearance was just ten days before his surgery. he knew that, but the rest of us did not. that same week president clinton 's former white house doctor connie mariano was asked to weigh in on the governor's weight which she did without hesitation. >> i worry that he may have a heart attack , he may have a stroke. >> reporter: the governor responded swiftly and bluntly. >> if she wants to get on a plane and come here to new jersey and ask me if she wants to examine me, i'll have a conversation with her about that. until that time she should shut up. >> during the dr. mariano incident and the doughnut incident on dave you knew i'm going in to get this all fixed so it is all moot. >> or at least i hope it will be all moot. i knew that. it was scheduled. doesn't make dr. mariano's conduct any less reprehensible. and the doughnut incident with david letterman was kind of like my good-bye. i've been through so much of this over the last 20 years, that i'm not taking any victory lap and i'm not preaching to anybody. i know how hard this is. >> the surgery was supposed to happen back in the fall. but then something happened that shook the state and the nation and up-ended the governor's life. >> we're starting to see water coming up on these duns. this thing is just getting wound up. >> hurricane sandy smashed the coastline. the ocean came right ashore. and riding this stretch of beach still closed off to prevent looting, it's almost more apparent now six months later that sandy hit in katrina-like proportions. we're driving along here and you find optimism here? >> i do. you know, the pilings are coming in, the worldwalk will be built here, will be all done here by memorial day . and you know, you see things happening and rebuilding. so yeah, i see hope. i absolutely see hope. >> though it's harder to see hope farther on up the beach. remember 350,000 new jersey homes were either damaged or destroyed. >> that is just sad. that got pummeled. >> still stuff on the shelves. six months and still stuff on the shelves. >> on the boardwalk, the suffering and the emotions of those hardest hit are right on the surface. >> i lost a house in the beach. we're like the forgotten step child . the same way it was six months ago. >> except the problem is they've got to decide and everyone's got to decide what they're going to do with their own homes. >> how can i build when it's so hazardous there. >> you're telling me the reasons you can't do it. what do you want me to do? knock down the houses ourselves, have the state do it and take people's property? i don't think you want me to do that. >> so we have to work with each other. you as neighbors have to get together and work with each other. >> another woman approached to thank the governor. >> it's been hard, but thank you so much. >> six months, really hard. >> if it wasn't for you, i wouldn't have gotten anywhere. >> that's what i'm here for. >> tell me about that enkointer just now. >> she told me that the inspector came today and they're going to start rebuilding her house and she got really emotional about it. she's got a 91-year-old grandmother who lives with them, her mother and a 7-year-old son. so that was the -- that's a good part of the job . >> chris christie is a tactile politician, a lot of scared new jerseyans threw their arms around that fleece he wore during the crisis. bruce springsteen even thanked him for his efforts. 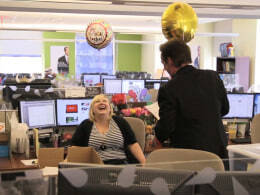 the blurry photo of the handshake following the nbc sandy telethon ended years of an unrequited bromance. christie 's been to 132 bruce concerts. the now famous fleece is featured in his first campaign commercial which gauzily plays up his storm relief efforts and looks a bit like the sopranos opening sequence when played side by side . >> another hug, what a day. >> christie is riding an almost 70% approval rating into the november election, but ask republicans nationally and you'll get a different answer. he supported mitt romney , but befriended barack obama . he gave the expected red meat keynote address at the gop convention, knowing most in the audience didn't regard him truly as one of them. some still angrily contend he helped obama's re-election. how often do you reflect back on the political price you paid for getting along with our current president? >> well, listen, i don't spend a lot of time worrying about it because in my heart i know i did what was right. and all i did was actually compliment someone who was doing their job well. the people who second guess this are the typical political armchair quarterbacks who never in their lives have had to make a decision like the multitude of decisions i had to make in a short period of time under enormous stress seeing my home state, the place i was born and raised, destroyed. >> his roots are indeed right here, as he proved, taking to us the house a few blocks away that he rented with a few pals the summer after high school graduation. how many guys, what year, what was the circumstance? >> summer of 1980 , after high school graduation, 12 of us. >> sadly representative of a lot of places here. >> right now there's very little to stop the ocean from roaring down this street again. so christie wants to shore up the shoreline defenses. >> have those dunes rebuilt. >> he wants new dunes and replenished beaches along over 100 miles of coastline. >> that's somebody raising up to a new level. >> that's someone raising their home. >> not everyone is in favor of a one size fits all solution. 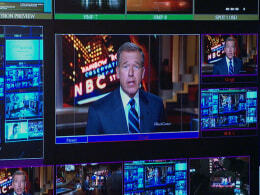 now, friday night at 10:00 p.m . you're watching this broadcast from olatha, kansas, middle america , great solid suburb. and you'd be forgiven for wondering why should my taxpayer dollars contribute anything to this boardwalk or the pictures i've seen of pumping sand back on to a beach that mother nature has decided belongs elsewhere? make that case. >> because in kansas, in iowa, in illinois where they're experiencing flooding, we don't ask in new jersey why should we contribute to rebuilding homes or rebuilding infrastructure near these rivers that overflow on a regular basis and cause great havoc. we're americans and we help other americans. and we don't micro manage their choices. >> the governor wants jersey 's boardwalks rebuilt and open for business by memorial day because they're such a big part of the huge engine of summer tourism. walking these boards, while it helps to speed jersey , there aren't a whole lot of elected politicians you can speak to this way. did you want some body piercing while we're here? >> i usually do it in the summer when my skin's warmer. >> you're like the rest of us. >> there aren't a whole lot of elected politicians who speak like him. >> what about this, brian? right? how are you, guys? see, you only live once. spring break 2012 . >> you only live once. >> i'm not as good with the sleeveless stuff. >> how are you guys? good. >> see soon you'll be in the sleeveless stuff. >> a whole new you. >> they can't wait for that, can they? this is the crap i have to hear. >> reporter: chris christie has made bombast a cottage industry. >> [ bleep ] okay? that's what it is. >> oh, my god, what is this? a first date. >> his comedy exploits have included snl, fallon and letterman. >> there's one chris christie 's whose funny on talk shows. >> and it's those exact clips that are being used against him in an ominous attack ad that's airing now with five months to go before the election. >> there's nothing funny about what republican governor chris christie is doing to our families. >> governor chris christie . >> a guy from new jersey who often leads with his mouth, and while he's getting smaller, he's still a big, brash, northeast governor who has so little in common with what tends to be a southern-centric conservative core of his own party. if you ran as a republican for president of the united states , what republican party do you see that would support your candidacy out there right now? how would you survive a primary process in the current setup of the republican party ? >> i think very well. i'll worry about the presidency if and when i ever decide to run for it. but if you're saying to me, how do i feel as a republican? i'm a damn good republican and a good conservative republican that believes in things that i believe in but that does not mean that i would ever put party before my state or party before my country. >> governor chris christie who told us, among other things, he's a climate change believer as he struggles now to rebuild, reform and restore 127 miles of precious new jersey coastline.